I have an allotment now what? This is written for anyone who is about to embark on starting an allotment in the Bradford District, the advice applies to anyone with a small plot of land to garden. If you want to apply for an allotment the contact is at the bottom of this page under useful contacts. As of 2012 the timeline for allotments in Bradford is: Allotment holders get billed in April to be paid by October. The Bradford Allotment Officer do site visits randomly all year round, any plots deemed un-worked, a Bad Cultivation Letter (BCL) is sent to the tenant giving them 3 months from the date to remove all weeds and rubbish from the site and to have at least 1/4 of the plot dug over. If the plot is still uncultivated unless there is good reason, the tenancy will be terminated and given 14 days to remove all personal belongings, before the plot it given to another person. As of 2012 Bradford introduced New Standards of Cultivation. You should make sure you get a copy of the full changes for cultivating your allotment. Here is a summary: 3/4 of the allotment is to be in full cultivation at any one time. Full cultivation will mean that the ground is dug over, weeds have been removed (or at least the seed heads have been removed) and crops are either actively growing or have just been harvested. The remaining 1/4 of the plot will be for the placing of a shed or greenhouse, compost bins and water butts, ponds and pathways, lawns and sitting areas. Once you get notification of an allotment, it is important you make a site visit as soon as possible to ascertain exactly which allotment you have been allocated. It might be worth checking with anyone gardening the site which number plot is which. You might hit lucky and get cultivated land, but this seldom happens partly because the way the tenancy works, someone who is giving up will likely hang on for a year which means the weeds will have got well under way. If you are not sure you have the correct plot ring the allotment officer up and explain. This is very important, as in the past people have dug the wrong allotment and all your work can be a waste of time. Once you have identified which allotment is yours, before you do anything else, check your tenancy agreement as to what you can and can't do, they vary from council. Then spend some time on the plot finding out what is yours; if it has any water butts or even a shed, and check that there are no materials as outlined in the tenancy agreement that should not be there. 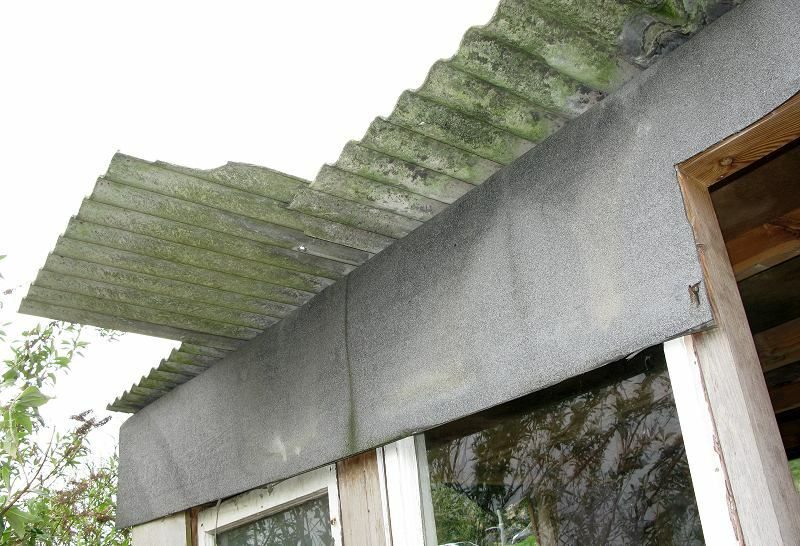 Despite all the warnings over asbestos (photo left, the roof sheets are asbestos) people have been known to bring it on to the site. 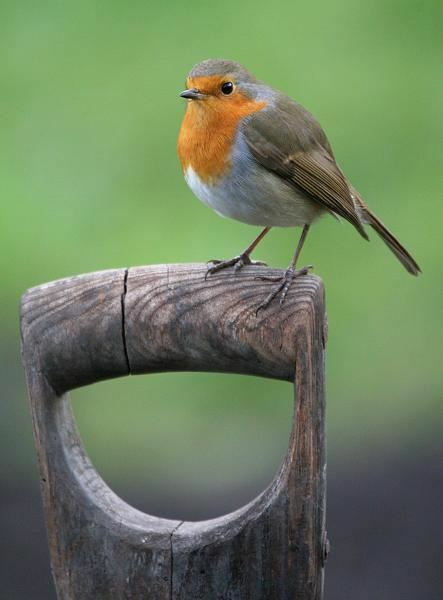 If there is anything you are unsure of ask the allotments officer about it before you start. Once you have established ownership and are happy with the site, take time to plan where essentials are to go. 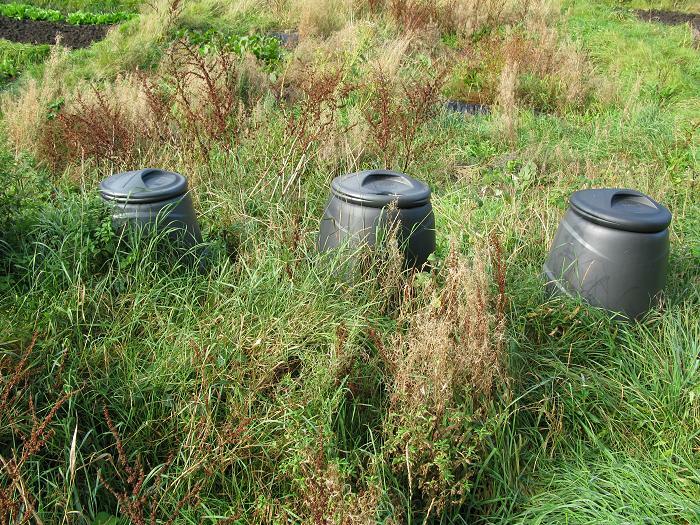 If the plot is on a slope try to put water butts and compost bins at the top so that you walk down the slope to water and spread the compost, rather than uphill. Check to see if there are any fruit bushes and if they are in good condition. If they are overgrown, ideally you need to prune them in the winter; currant bushes need one third of their growth taking out. Raspberry canes; the old wood needs removing and the new season's growth tying in. Autumn raspberries need cutting right back as they fruit on the new seasons growth. The ideal time to take on an allotment is the "back end" - October for a spring growing, however the way Bradford works means the tenancy usually lapses for a January start. At the early stage of having an allotment there is little to benefit hiring machinery, your plot is probably as bad as it gets, and is not likely to get worse. Instead, put your money, time and effort into a long term plan. One way to have a beneficial impact is to buy a large sheet of heavy gauge black plastic, preferably the width of the allotment, and lay this down on a section of the plot using bricks or stones to prevent it from blowing away. 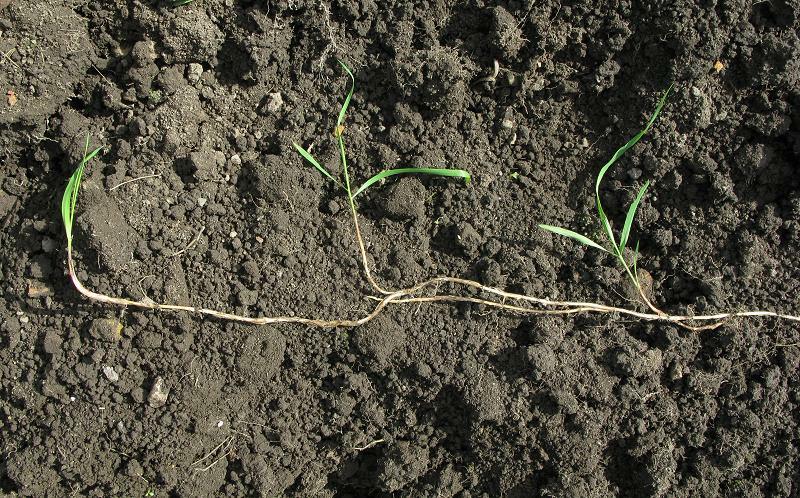 Any growth underneath this will now be suppressed by the lack of light; It will usually take at least nine months to a year for the weeds underneath to completely die. 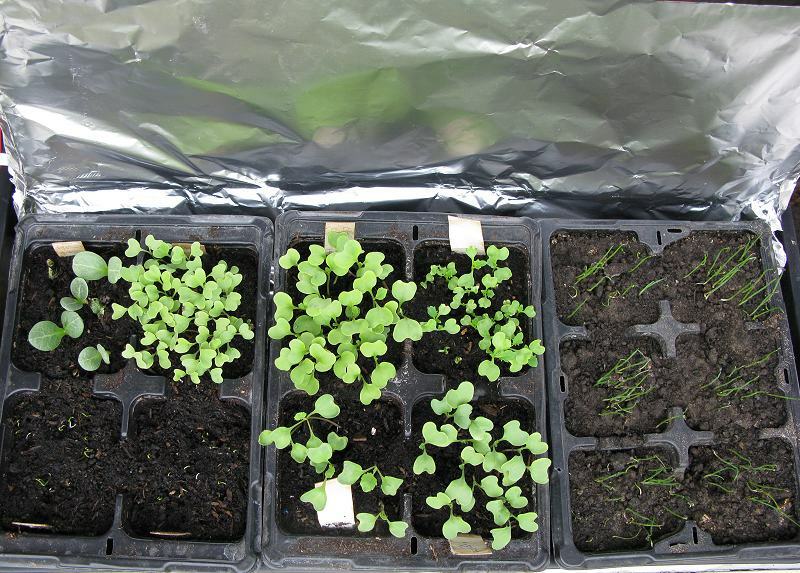 Other benefit is any annual seed will germinate earlier under the plastic due to the increased warmth with the black absorbing the sun's heat. Now is the time to do some digging. 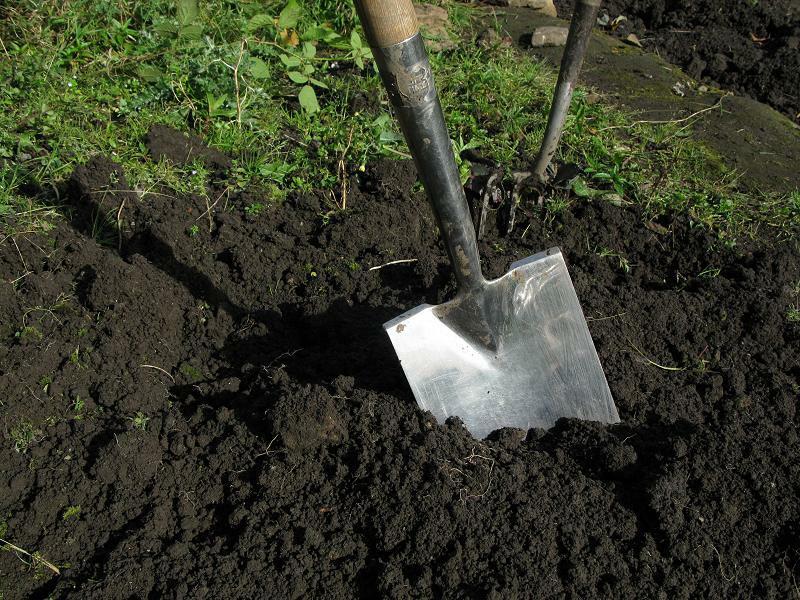 Pull the black sheet back and dig a small section of the land, dig with the spade turning the soil over and work the fork through removing perennial weed roots. It is worth investing in a good spade, a stainless steel one is ideal as the soil will not stick to it as much as a steel one. Aim to do a couple of hours work, a bit at a time is better than doing too much in one day. When you have finished digging a large plot for vegetables, pull the plastic sheet over another uncovered area. Keep an eye on the land you have dug making sure any new weed is removed. If you are on a Bradford Allotment, you need to be aware that as of 2012 you will have to have 1/4 of your allotment dug over by the end of three months. If you can get hold of horse manure in the autumn you can add as you you dig, and also put on top of the soil. 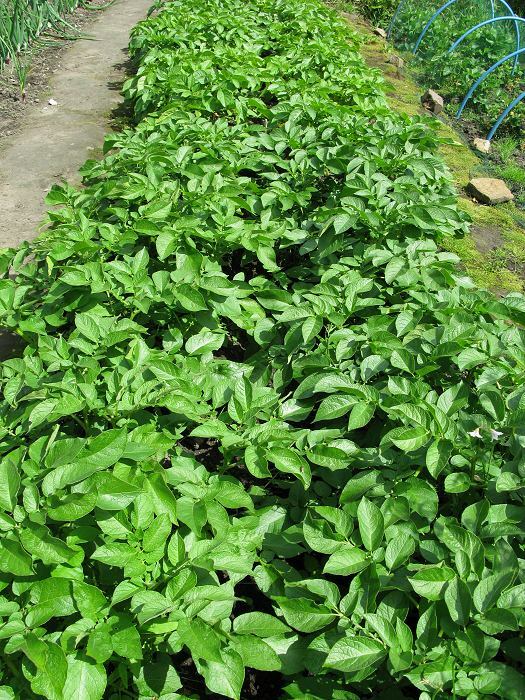 In spring you can add manure to trenches for potatoes. As you are clearing and digging the allotment you will be accumulating waste material such as weeds. The top layer of the soil is the most fertile ground so try to avoid dumping it in a pile at the bottom of the allotment. It is worth investing in a couple of compost bins. You can make two rectangular bins out of wood which are called New Zealand bins, or you could buy plastic compost bins which are ideal as they block light out. 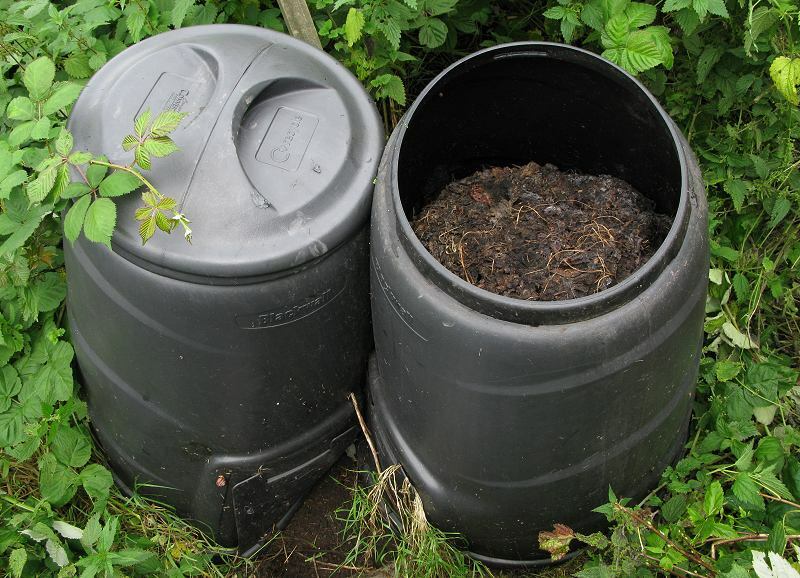 You will need at least two, one to add to while the other is composting. Your own compost can take some time to rot down and become usable, it is quicker in the summer months with warmer weather. If you can find well rotted horse manure preferably straw based is beneficial to add to the soil while you are digging in the autumn. Avoid horse manure with wood chipping as some of the larger wood chips if added to soil can rob nitrogen in the process of rotting down. As the season progresses and there is a spell of dry weather it can make digging difficult, by the end of April it is best to stop digging and concentrate on keeping the land you have weed free. 3) Others; (Pea, Bean, sweetcorn, courgette, onion etc). Doing this means there is less risk of increased build up of pests, and some crops benefit from occupying the land from previous crops such as peas and beans which lock beneficial nitrogen in their roots. You will need to consider adding fertilizer to the land to ensure there is enough NPK (Nitrogen Phosphorus, Potassium) in the soil. It is worth looking for products that are organic, Chicken manure and Seaweed extract are popular choices. It is a good idea to check what the PH (acid - alkaline) of the soil is like. 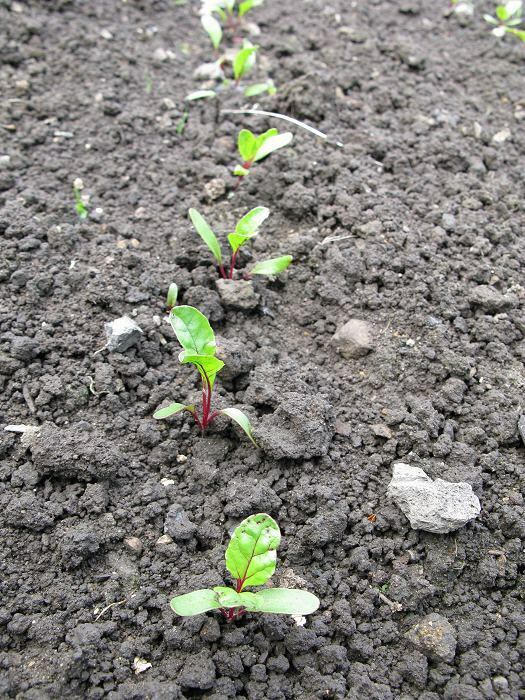 Potato can tolerate acidic soil to a point, but other vegetables such as brassicas need the soil to be alkaline. You can buy a soil testing kit to determine how acid/alkaline the soil is. You need to adjust this as early as you can by liming the ground. You are looking for a neutral PH to alkaline soil. Liming is best done in autumn. An important aspect of gardening is keeping weeds under control. Buy a good quality hoe and keep it sharp. You are aiming to cut annual weeds just below the surface. Do this when the soil is dry and on a sunny day, once you have hoed the weeds they will dry out and die in the sun. This is when you appreciate growing vegetables in straight lines meaning you can hoe in between rows easily. 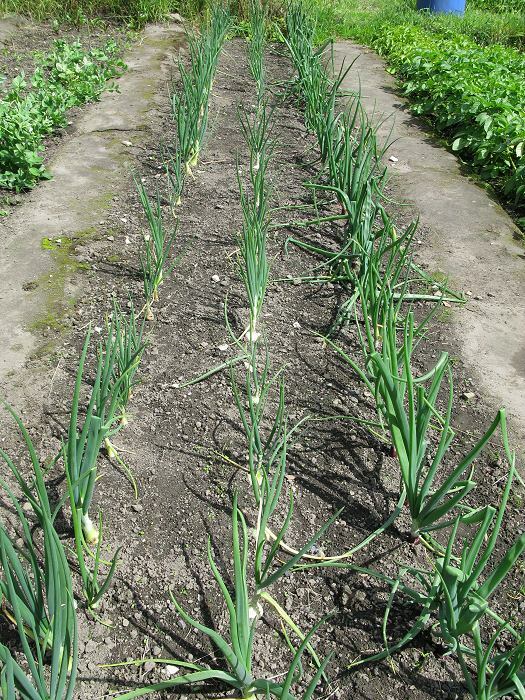 Watch crops such as onions which have a shallow root system avoid going too near, better to hand weed around them after the main hoeing. If it is overcast spend time hand weeding, If you hoe when the ground is wet you churn the weeds up and they can grow back again. "One year's seed is seven years weed" is very true. If you are on an allotment it is worth asking the other gardeners when they are putting crops in. When you get experience you will be able to make a judgment as to when you feel is the best time for you. Times to consider is when the chance of the last frost is likely to happen. In Haworth this can be anytime from early May to early June. To get a head start on the season you can sow some seeds indoors. There are two main types of seed; Hardy annual, such as Broad Bean, Leek, Cabbages which can tolerate some cold weather, and Half-hardy annual, such as Courgette, Sweetcorn, French Bean which do not like frost. 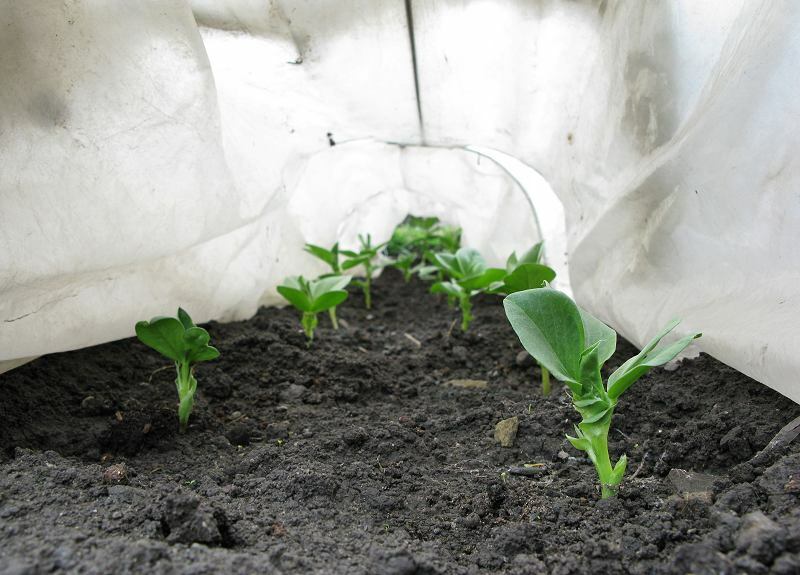 There is no hard and fast rule as to when you can sow and plant out but an example is: Broad Beans were sown indoors in mid February, they were planted out on 22nd March under a cloche with a fleece covering over, mainly to prevent the wind blowing the cloche away! They were growing fine on 8th April when the photo (left) was taken. If you don't have a greenhouse you can put the seedlings on a window cill. To prevent them growing "leggy" turn the pot around periodically. You can also add a sheet of aluminum kitchen foil to the back of the pot which will reflect light back. Some root crops such as turnip, carrot, beetroot do not re-plant well due to not liking their root system being disturbed. Chances are you will have had success growing some crops and a few failures, talking to other gardeners may help you gain knowledge and get to grips with any problems experienced. 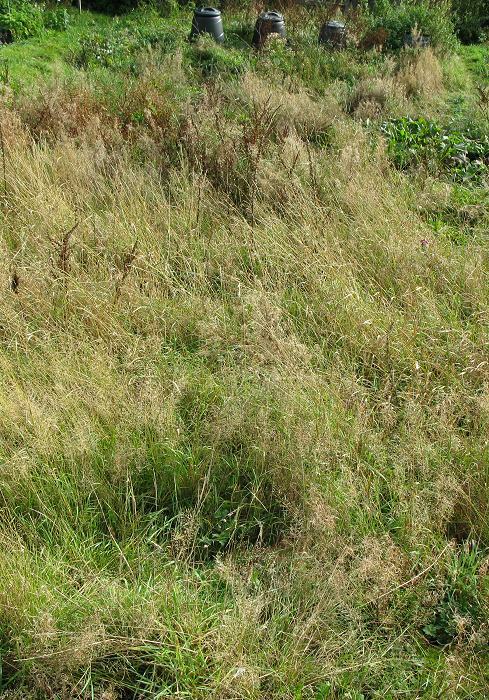 You should have areas of land where it is clear of most weed an area where the black plastic is suppressing weeds and another area which is still overgrown. 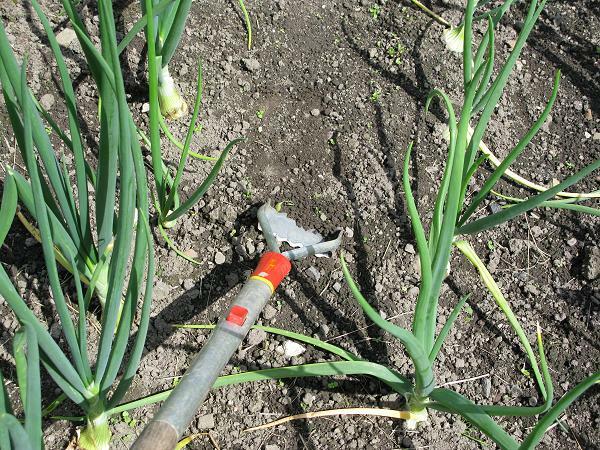 As October approaches you can get back into digging the plot again as the annual weeds will recede as the cool weather and shorter days approach. It makes sense to dig the ground over in the winter ready for the new season, the birds will find weed seed and the frosts will break the soil down. At the beginning of this article for various reasons it was not recommended to use machinery when starting a new plot. However, as you plan for your second year and feel you have the allotment under control, you might want to consider labour saving tools. 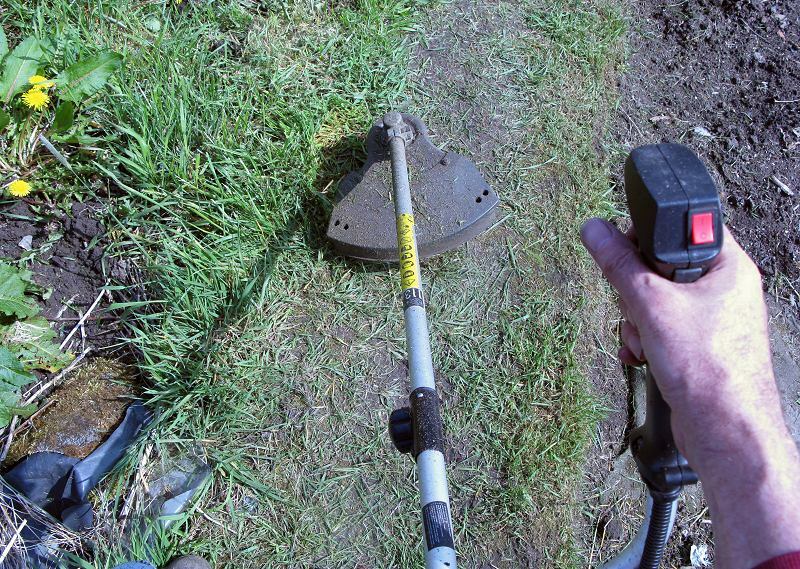 One of the best devices for keeping paths clear is a strimmer. Try to look for one where the shaft splits in two as it makes it easier to carry to and from the allotment. Unless your shed is like Fort Knox, do not leave it there as sooner or later you will be broken in and it will be stolen. The choices are either petrol or battery, the pros and cons are: Petrol: Pros; Last for as long as you have fuel, more powerful than a battery model. Cons; mixing petrol and oil for two stroke engine is messy, noisy and can be a problem to start. Battery: Pros; Easy to start, quieter. Cons; Life of battery is limiting factor, less powerful. You might start thinking about putting a shed on your plot, current law as of July 2009 states that you do not need written or planning permission to erect a shed, greenhouse or poly-tunnel on allotment land. Please note that a shed or greenhouse larger than 8ft x 6ft that require foundations or are connected to services, might be construed as a permanent structure. 2 Council owned sites - one near the Parsonage and the other near Rawdon rd. If you have any advice or tips about growing, contact us and if suitable will add to the page - please local to Haworth and the surrounding area only. Sadly TV programmes such as BBC Gardeners World have become "lifestyle" programmes giving no real practical value, especially when you are gardening in a challenging place such as Haworth. However there is one excellent programme called Beechgrove Garden which is made in Scotland and they have similar issues with our weather; the wind and the cold, and have a very "down to earth format". As of 2012 you can only watch using iplayer as it is for Scottish audience.